Note 1: Like Neo Geo games? Check out some of my other reviews! 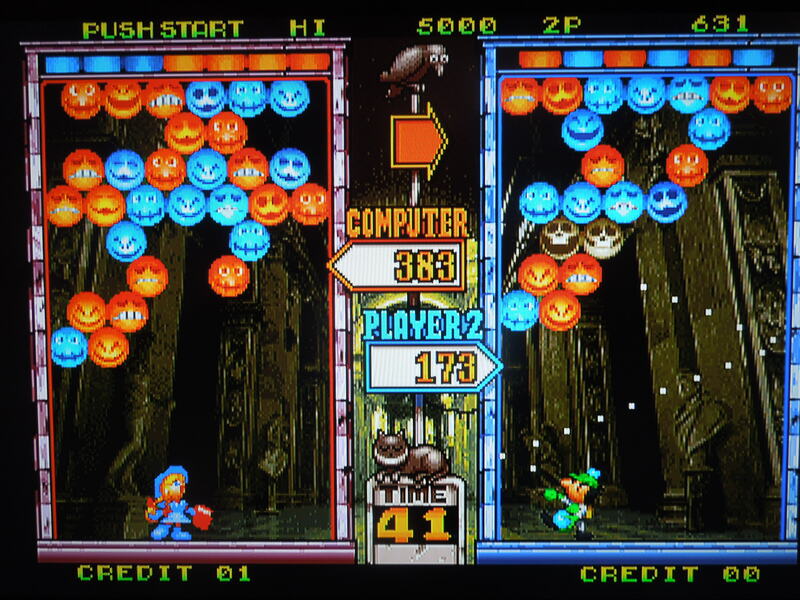 Note 2: This game was played on a Neo Geo AES home console that has been modified to output in component video (green, blue, red). The Neo Geo AES was connected to a 32-inch HD tv. Ghost Lop never received an official release. 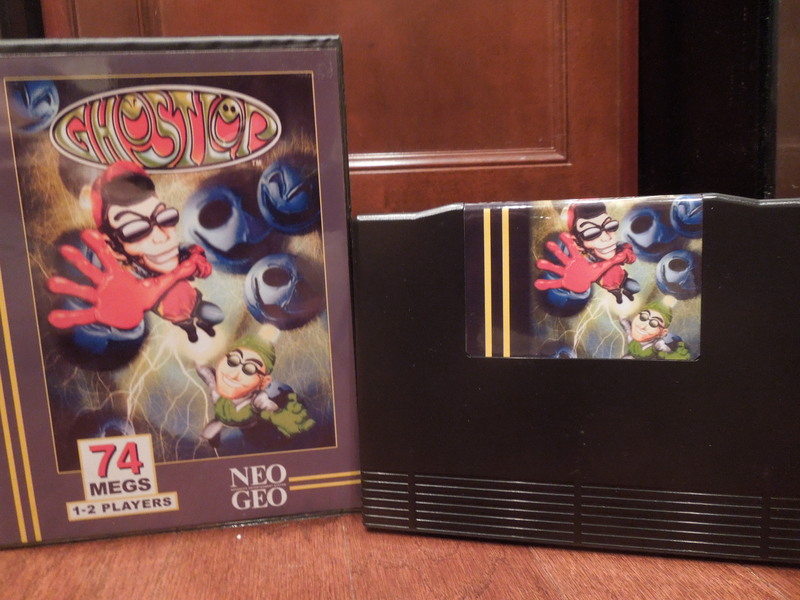 Quick History: Ghost Lop was developed by Data East, yet was never officially released for the Neo Geo, neither the AES home console nor the MVS arcade cabinet cartridge. There were, however, arcade prototype cartridges issued, and the game was actually a ‘complete’ game. Because Ghost Lop was never officially released, and there were only ‘prototype’ cartridges, its history is quite complex, and if you’d like to read more about it, I advise Googling ‘The Real Story of Ghostlop by Billy Pitt.” I tried posting a link but for some reason it won’t activate through my website. The cartridge used for this review is an AES conversion cartridge using new eproms. 8 opponents await you in Ghost Lop. Memory Card Support? Yes. 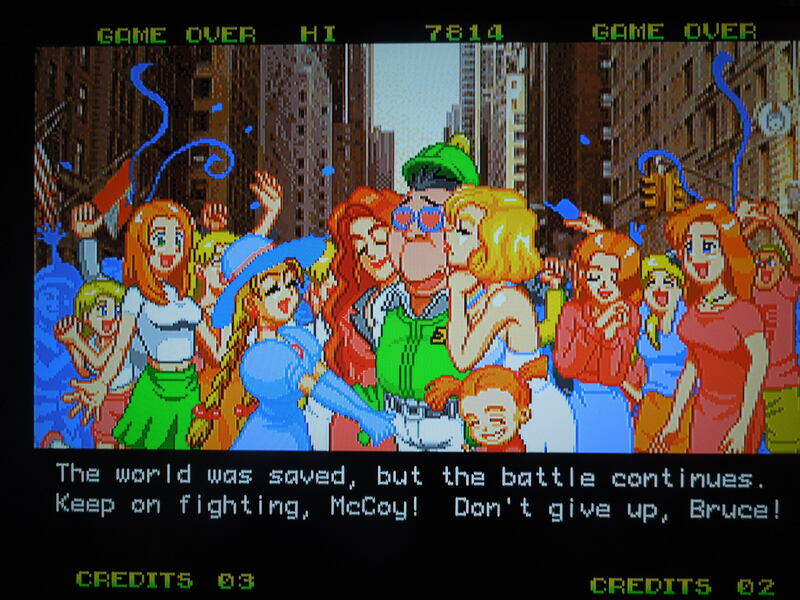 After you use your 4 Credits, or after you choose not to continue, you’ll have the option to Save your game, allowing you to return to the stage you were last on. Story: Taken directly from the intro: “Bruce is a ghost hunter. He works at a company that specializes in hunting and evicting ghosts. He and his partner, McCoy, work hard every day under the supervision of Rachael, the demanding president.” I noticed (lookswise) parallels between the game characters and characters from the popular GhostBusters films. Bruce has the look of Peter Venkman (tall and thin, brown hair), McCoy of Ray Stantz (a bit portly), and Rachael of Janine Meltinz (with the red hair, although in the game she’s the boss, not the secretary). Options: You can adjust the difficulty from 1-8, and you can turn the timer (which runs from 99 seconds down to zero) on or off. 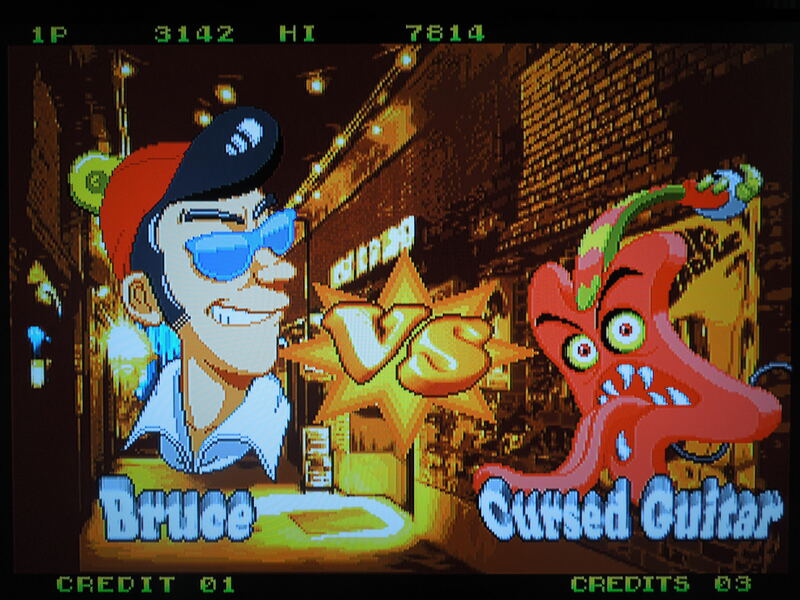 Gameplay: In Ghost Lop, you control either Bruce (if your controller is plugged into port 1) or McCoy (if your controller is plugged into port 2) and must engage in 8 ‘battles’ with other characters/monsters to beat the game. Your goal, during each competitive battle, is to destroy more Red and Blue Ghosts than your opponent. 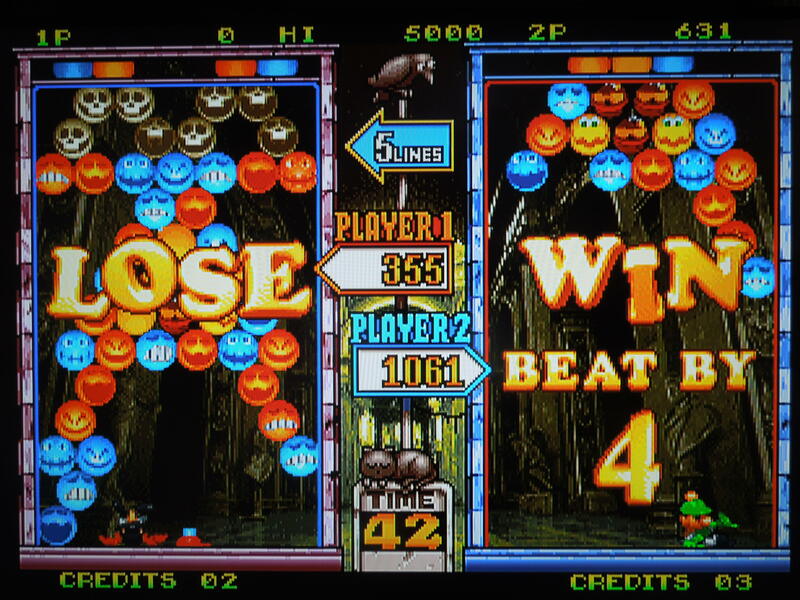 By destroying the Red and Blue Ghosts, you get particular point totals, and when the clock hits zero, whoever has the most points, wins. If the clock has been turned off, then the first to 5,000 points wins. 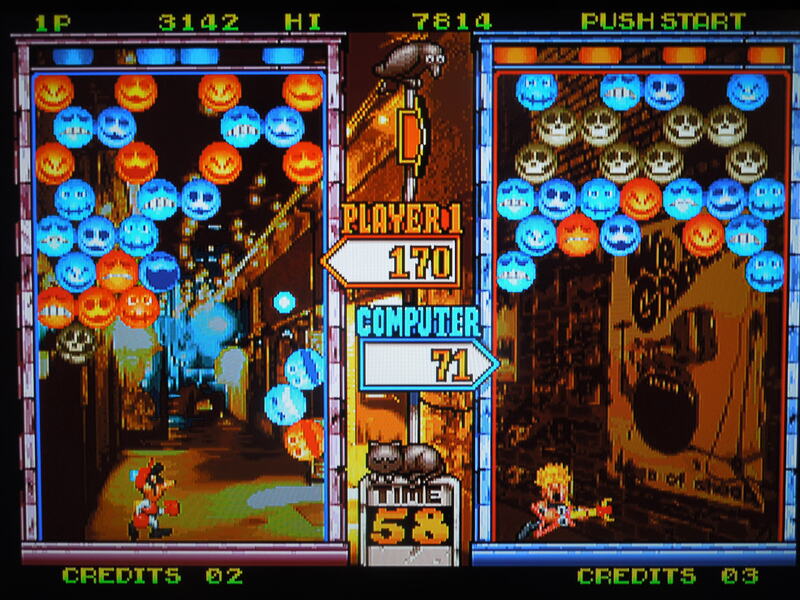 Rounds can end early if the Red or Blue ghosts fill up you or your opponent’s half of the screen (overwhelm you). Each battle is a Best of 3 Rounds fight. Destroy more Ghosts than your opponent in order to win a Best of 3 Rounds battle. Control: So, how do you fight the Red and Blue Ghosts in order to beat your opponents? Button A throws a red ball that destroys Red Ghosts. Button B throws a blue ball that destroys Blue Ghosts. By holding the joystick right or left, you can move your character left or right, and once stationary, you can throw either colored ball (you can also change the color of your ball anytime during its flight by pressing the button for the other color) at the Ghosts. While standing still, you can angle the ball to take out as many Ghosts as you can with a single throw – anytime your ball connects with a Ghost of the same color, that Ghost will disappear, as well as any beside it that are of the same color. You have to catch the ball when it bounces back your way, however – if you miss and it hits the ground, then an entire line of ghosts will advance. You can bank the ball off the walls to squeeze it into tight places and take out dozens of ghosts with a single throw – the more ghosts you destroy per throw, the higher your points go. Additionally, for every ‘large amount’ of Ghosts you destroy on your half the screen, a line of Grey Skulls will appear on your opponent’s screen, making it harder for him or her to attack his or her own Ghosts. *Note your opponent will do the same to you. Select pauses the game. Your score and rank are given after each opponent you beat. Other Ghosts: In addition to Red and Blue Ghosts, there are 3 additional Ghosts that can appear on your screen. Grey Skulls can be destroyed by striking them twice with either a blue or a red ball. Dark Red Ghosts can be destroyed by striking them with either colored ball, and doing so causes them to explode and destroy any surrounding Ghosts. Lastly, Yellow Ghosts can be struck with either a red or a blue ball, and this will destroy every Ghost on screen. Choices/Branching Paths: After your first two opponents have been beaten, you’ll begin having choices about what to do next. For example, Rachael (your boss) will tell you to go to Randy’s room to deal with the Ghost Under the Bed or to Jennifer’s House to fight the PolterGeist. Later, LuLu the Exorcist will offer you a job – accept it and you’ll fight the Cursed Guitar; deny her and you’ll fight the Amusement Park Horse. To some degree, the choices you make impact the next set of choices you’ll get, leading to multiple branching paths each time you play the game. Regardless of your path, you’ll always have to face 8 opponents, ending with the Great King of Terror. The people of the city are in need of your ghost hunting expertise. Music and Sound Effects: There are different songs for each opponent you face, and each character/monster has his or her own speech/sound effects, adding variety to the game. The Red and Blue Ghosts cackle when you make a mistake, adding a creepy humor. Additionally, each opponent has a different background screen that is appropriate for where your fight takes place. High Score: Your score is given after each opponent you beat in the Best of 3 Rounds battles. Based on how quickly you dispatched your Red and Blue Ghosts (and therefore your opponent), you’ll get a particular ‘Hunting Level’ (Rank) from A-F, and points for Average (? ), Miss (how many times you didn’t catch your ball, I suppose), and Time. Your score resets after every Credit you use. Multiple Endings: I’ve discovered at least 2 different endings, although I believe there may be more. The two different ones I got seem to have been based on the choices I made during the game, and since there are multiple choices you make that could be different, I would guess there are more than two endings. In one ending my character got a brand new sports card as a reward for his hard work, and in another all of the female characters from the game were fawning over my character for his bravery. Endings vary based on what choices you make during the game. 2 Player VS: When you compete against another human player, one of you controls Bruce and the other, McCoy. The game keeps track of how many consecutive wins one of you may obtain. 2 Player VS. is great fun. Conclusion: Ghost Lop is a terrific game. It will take a while to figure out how to best dispatch of your Ghosts efficiently, but once you do, the game becomes maddingly addictive. It’s also great that you can adjust the difficulty level from 1-8 and adjust the clock on or off. 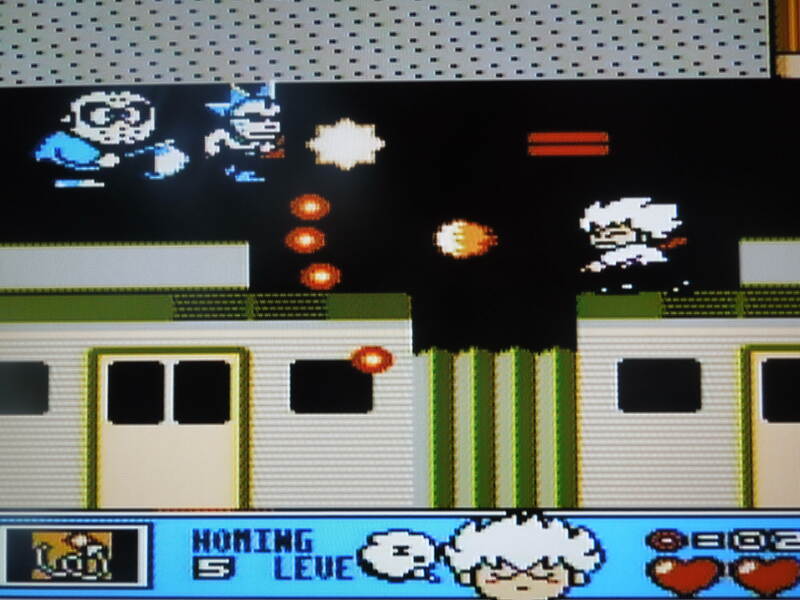 I will say that even on Level 1 (Easiest), the game’s second opponent, Friday the Ghost Dog at the Pet Cemetery, is the hardest opponent in the game – get by him, and you’ll be good to go. The addition of choices and branching paths means you can’t see or fight all of the game’s opponents on your first or even second playthrough, adding replayability. Multiple endings is always great too, of course. 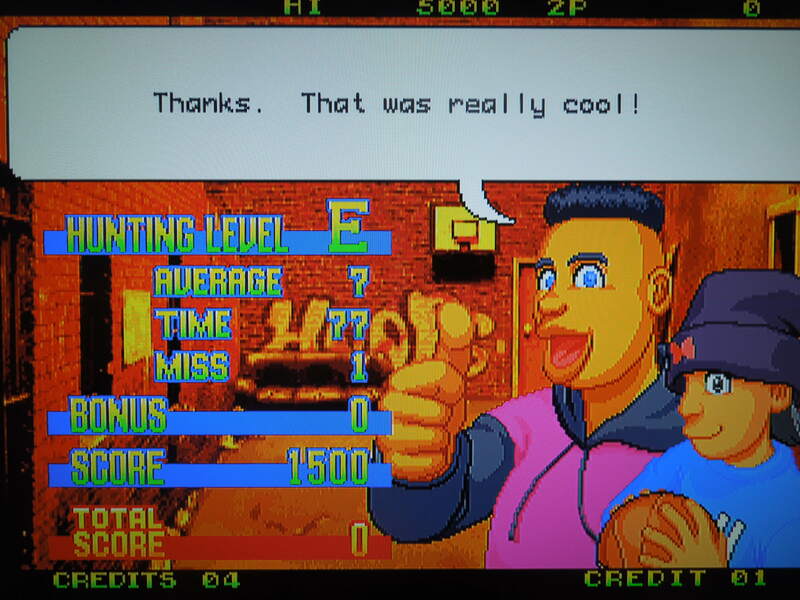 This entry was posted in Neo Geo - Ghost Lop and tagged Ghost Lop Neo Geo review. Bookmark the permalink.